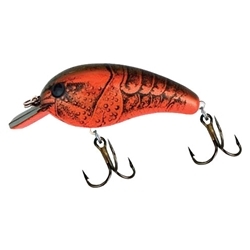 Cotton Cordell's Big O was designed after Fred Young's orginal balsa wood crankbait from 1967. The shorter lip is great for deflecting off of cover and will dive to 5 feet. The standard Big O is 2-1/4" 1/3oz with #6 hooks and the smaller C76 series is 2" 1/4oz whit #8 hooks.